Welcome to the Never Be Stuck in the Cold Giveaway! 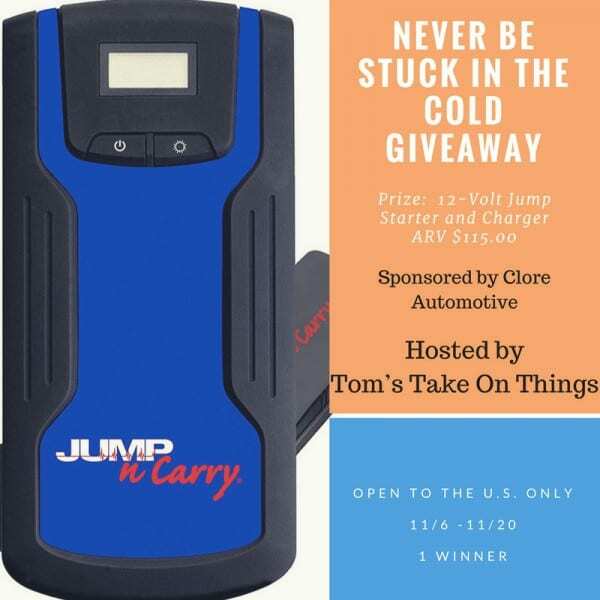 Don’t be afraid that the winter season is soon upon us when you have a dependable 12-Volt Jump Starter like this one from Clore Automotive with you. Everyone should have an emergency kit in their vehicle. The kit should include bottles of water, some snacks, blankets, a flashlight, extra gloves, flares, a first aid kit and a jump starter like this JNC 318 that is compact enough to carry with you. With this jump starter, even if you are alone and can’t get someone to come help you boost your battery, have the peace of mind knowing you can easily do it yourself if you had an emergency. Tom over at Tom’s Take On Things was given a chance to review one of these and you can check out that article here. Tom is a former 24-year career Paramedic so one thing he knows about is safety and how to be prepared. How would you like to win one for yourself, or to give it as a gift idea for a loved one who might need it more? Just enter using the Giveaway Tools widget below. Open to residents of the U.S. only, and it ends on 11/20 at 11:59 pm EST. Tom’s Take On Things and blogs like mine helping promote this giveaway were not compensated for this post. Prize delivery is the responsibility of Clore Automotive. I actually need to make an emergency kit for out vehicle, I think of it but forget to all the time, and definitely this would be wonderful! It scares me to think that I don’t have an emergency kit in my car. Yes this giveaway would be helpful. I have a shovel and jumper cables. This would be great because I could use it myself. I have jumper cables in my van and a few blankets. Other than that, I really should have an emergency kit in all our vehicles. Thank you for the giveaway. I have a first aid kit and jumper cables in my car. Since my car is older, I could definitely use the jump starter you are giving away. As we recently found out that a battery in our newer car went out with no warning at all. We all need to be prepared for any type of emergency.